The diagnostic imaging services at Tufts VETS offers state-of-the-art radiography, ultrasonography and computed tomography to aid in the timely diagnosis of our patients. The service is staffed by an American College of Veterinary Radiology board-certified radiologists and licensed technicians. Our diagnostic services collaborate with other Tufts VETS specialties including internal medicine, critical care, ophthalmology and surgery to provide advanced diagnostics for case management. The service also works closely with referring veterinary hospitals as both a referral center and consultation service. CT examination is performed in house with our multi-slice helical CT.
Additionally, MRI exams can be scheduled and obtained through our affiliation with the Cummings School of Veterinary Medicine at Tufts University. We have installed the latest technology in our fluoroscopy and digital radiography suites. 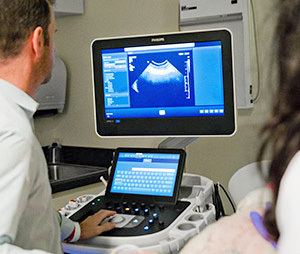 Our ultrasound suite is equipped with the latest technology with high frequency and phased-array transducers and the ability to perform both flow and tissue Doppler and harmonic imaging. Outpatient ultrasound: advanced imaging for your patients - Tufts VETS provides outpatient ultrasound service for local veterinarians. Call us at 508-668-5454 to book an appointment. Clients bring their pets to Tufts VETS where the ultrasound is performed and a complete report is emailed and faxed back to you. For emergency cases or patients requiring immediate care, we will call and discuss the case with you. We will also help you schedule an appointment with our emergency, medicine, surgery, dermatology or ophthalmology service to accommodate a specific procedure if needed, often on the same day. Fluoroscopic examination - For cardiology, respiratory and GI cases, the specialists at Tufts VETS offer fluoroscopic examinations, a dynamic imaging modality for angiography, tracheal and esophageal disorders, myelography and interventional procedures. This is available on an inpatient basis. In cooperation with our emergency department, we offer rapid diagnostics on an inpatient basis. If necessary, an ultrasound can be performed by our internist or ER/ICU clinicians, to be followed up the next day by a board-certified radiologist.